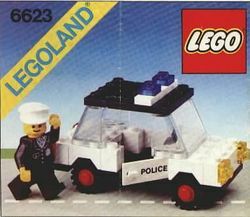 6623 Police Car is a Town set released in 1983. It contains a police car with blue lights on top, yellow headlights, and doors that read 'police' on each side. Also included is a police officer minifigure. Similar to other Police sets, this set only seated one person. This meant no room to carry a prisoner. This vehicle is very similar to the police car from 6384 Police Station. Facts about "6623 Police Car"
This page was last edited on 29 April 2016, at 12:40.